Background In non-randomised evaluations of public-health interventions, statistical methods to control confounding will usually be required. We review approaches to the control of confounding and discuss issues in drawing causal inference from these studies. Methods Non-systematic review of literature and mathematical data-simulation. Results Standard stratification and regression techniques will often be appropriate, but propensity scores may be useful where many confounders need to be controlled, and data are limited. All these techniques require that key putative confounders are measured accurately. Instrumental variables offer, in theory, a solution to the problem of unknown or unmeasured confounders, but identifying an instrument which meets the required conditions will often be challenging. Obtaining measurements of the outcome variable in both intervention and control groups before the intervention is introduced allows balance to be assessed, and these data may be used to help control confounding. However, imbalance in outcome measures at baseline poses challenges for the analysis and interpretation of the evaluation, highlighting the value of adopting a design strategy that maximises the likelihood of achieving balance. Finally, when it is not possible to have any concurrent control group, making multiple measures of outcome pre- and postintervention can enable the estimation of intervention effects with appropriate statistical models. Conclusion For non-randomised designs, careful statistical analysis can help reduce bias by confounding in estimating intervention effects. However, investigators must report their methods thoroughly and be conscious and critical of the assumptions they must make whenever they adopt these designs. Simple causal diagram of potential causal effects and links between exposure to the intervention, educational level and contraceptive use. In the traditional approach to controlling confounding, women would be grouped (‘stratified’) according to their educational level—for example ‘none’, ‘attended primary school’ and ‘completed primary school.’ The association between intervention and outcome is examined within each group. Any association within groups cannot be due to confounding by educational status because women in each group have the same level of education, assuming this is correctly measured. If the intervention effect is approximately the same in all subgroups, a weighted average of the stratum-specific estimates provides an adjusted effect estimate free of confounding by that variable. Regression modelling can include multiple confounding factors as explanatory variables,11 and was used in the Nepal study to control 11 potential confounders, assuming no effect modification. This adjustment reduced the estimated effect from +12% to +6% (table 1), consistent with the unadjusted estimate being partly confounded (overestimating the true effect). However, this adjusted estimate is unconfounded only if all important confounders are identified and measured accurately.12 13 Since we can rarely, if ever, verify this, residual confounding remains a concern. A regression model is used to identify factors ‘predicting’ exposure to the intervention. 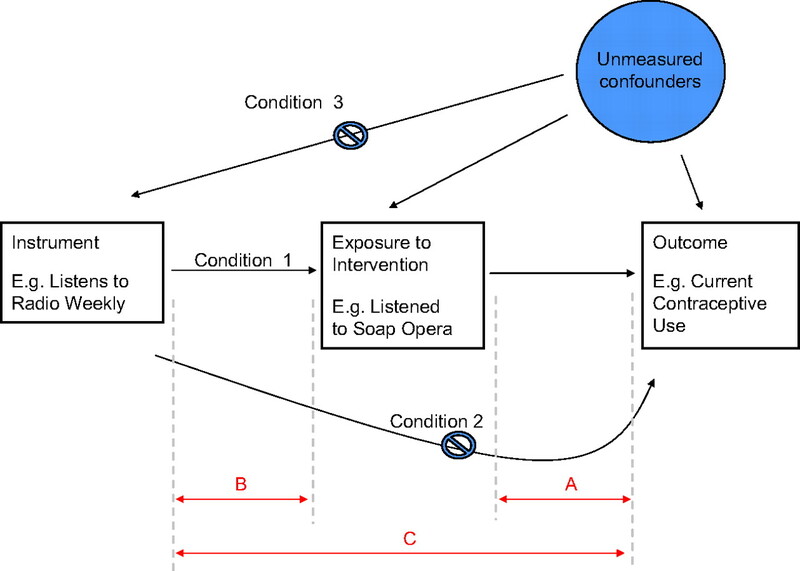 The model is used to calculate each individual's predicted probability of, rather than actual, exposure to the intervention (eg, ‘listened to the soap opera’). Individuals with similar propensity scores are grouped. Within each group, some individuals will actually have been exposed to the intervention and some not. Since individuals in each group had the same propensity to be exposed, the method assumes that actual exposure within these groups was random. Stratified analysis can compare outcomes between exposed and unexposed individuals within each propensity-score group and by including the propensity score group in the regression analysis, it is possible to obtain an unconfounded estimate of the intervention effect. Alternatively, each exposed individual may be matched with an unexposed individual with the same or similar propensity score and the analysis restricted to these pairs. it is not associated with any unmeasured confounders of concern in the study population. Causal diagram indicating the conditions under which a variable (the ‘instrument’) will enable the investigator to control unmeasured confounding variables. Treat them in the same way as other potential confounders, and fit a regression model in which the preintervention measure of the outcome is included alongside other potential confounders. Calculate the change in the outcome, and base the analysis on the difference in the changes in the two groups. However, when non-random allocation results in two groups which are drawn from two different populations, and hence are unbalanced at baseline, the two approaches can give contradictory results. This has been described as ‘Lord's paradox’ and was first identified in the context of individual-level data.27 28 29 To illustrate this paradox with an example relevant to our purposes, consider a hypothetical cluster-allocated, non-randomised study of an intervention aiming to lower mean systolic blood pressure (MSBP) among individuals in workplaces by influencing exercise and smoking (100 intervention, 100 control sites). Intervention allocation was non-random determined by stakeholder meetings to identify which workplaces receive the intervention.1 This resulted in a systematic imbalance in MSBP between the two arms at baseline (intervention 120 mm Hg, control 115 mm Hg). Following intervention, measures of MSBP were taken from individuals in all workplaces. MSBP did not change between baseline and follow-up in either the control or intervention workplaces. In this situation, because blood pressure differed between the groups (was unbalanced) to begin with, regression analysis can incorrectly suggest that there was an effect of the intervention in some situations, while an analysis of change in the outcome does not.27 28 29 Here we offer one suggestion for how this paradox might occur and reflect on guidance for evaluators in this situation. 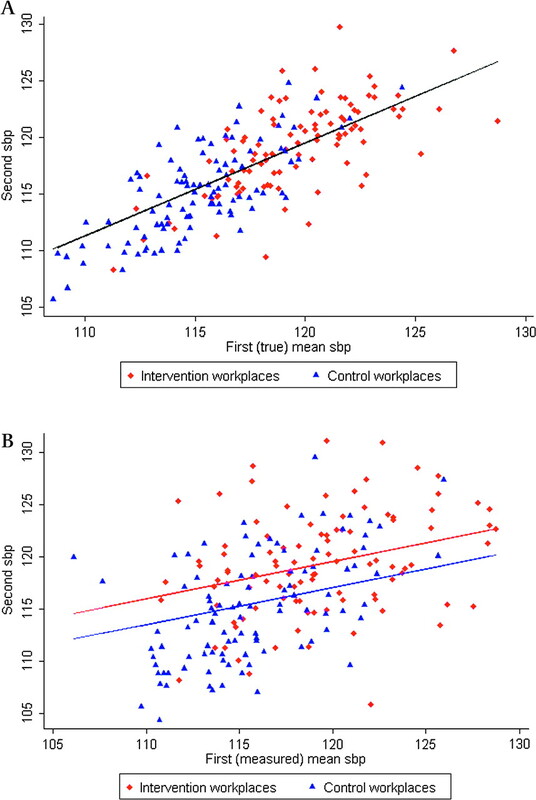 Figure 3 shows the results of two simulations of the experiment with preintervention MSBP plotted against MSBP postintervention for all intervention and control workplaces. In figure 3A, we assume that MSBP was measured ‘perfectly.’ Over 1000 simulations, there was no evidence for a difference between the groups from either regression analysis or analysis of changes. However, when we allowed ‘noise’ in the baseline measurements of MSBP (figure 3B), there was evidence of a difference between the groups in regression analysis but not change-scores. Our simulation assumed that each individual had the same true underlying MSBP at both baseline and follow-up, that is, we assume no real change in either group, but that at each time-point, there was independent random measurement error. Our simple simulation suggests that one possible explanation for paradoxical findings when comparing an analysis of changes with a regression analysis is that ‘noise’ results in dilution of the association between pre- and postintervention measures, as identified by linear regression, known as regression-dilution bias.30 This phenomenon reduces the gradient of the regression lines in figure 3B compared with figure 3A. The regression lines for each group are consequently shallower, but are also centred on different means (because of the baseline imbalance) resulting in a vertical gap between the two lines. In regression analysis, this gap is equivalent to the estimated parameter for intervention effect, and might then be incorrectly interpreted in this way. Simulated data illustrating possible mechanism for ‘Lord's paradox.’ The vertical distance between the two regression lines corresponds to the ‘intervention effect’ estimate obtained from regression: (A) with no ‘noise’ in the baseline measure—this suggests no intervention effect, consistent with the analysis of change-scores; (B) with ‘noise’ in the measurements—regression suggests an intervention effect. Public-health interventions are often delivered to ‘clusters’ of people, and for practical reasons the number of clusters included in an evaluation is sometimes small.1 Cluster allocation must be appropriately taken into account in analyses, and this is relevant to both randomised and non-randomised designs.32 Low statistical power in such studies, including those where large numbers of individuals but only a small number of clusters are enrolled, is a major barrier to statistical inference. We do not seek to review this issue here other than to identify that allocation of a small number of units may also be a reason why imbalance might arise in non-randomised evaluations and thus indicate the need for control of confounding. However, many relevant statistical methods require additional assumptions when cluster numbers are low. We thus reiterate the more general point that while in-depth studies of interventions delivered in a few study units can provide valuable information on process and provide some forms of evidence to inform public-health decision-making,33 they are highly constrained in their capacity to provide quantitative estimates of intervention effect. When it is not possible to recruit a concurrent comparison group, it may instead be possible to compare each unit pre- and postintervention. However, once again, a ‘fair comparison’ should be made. The before/after approach, and more sophisticated variants of this in which multiple measures of outcome are made over time, controls for sources of confounding that are static over time but not time-varying factors such as maturational, seasonal or secular trends. The extent of variation in the outcome over time due to factors other than the intervention (eg, seasonal trends)35 is estimated statistically. A statistical model is used to predict the ‘expected’ outcome at the end of the intervention period had the intervention not been delivered. For example, the effect of introducing pneumococcal conjugate vaccine (PCV-7) for infants in the USA was evaluated by examining monthly pneumonia admissions (see previous paper, box 1).1 36 There were significant seasonal variation in trends in admission (figure 4). An expected admission rate at the end of the intervention period was obtained by extrapolating available trend data after modelling seasonal fluctuations. The analysis found that the seasonally corrected admission rate by December 2004 was 39% lower than the expected rate (95% CI 22% to 52%) providing an estimate of the effect of PCV-7 (figure 4A). 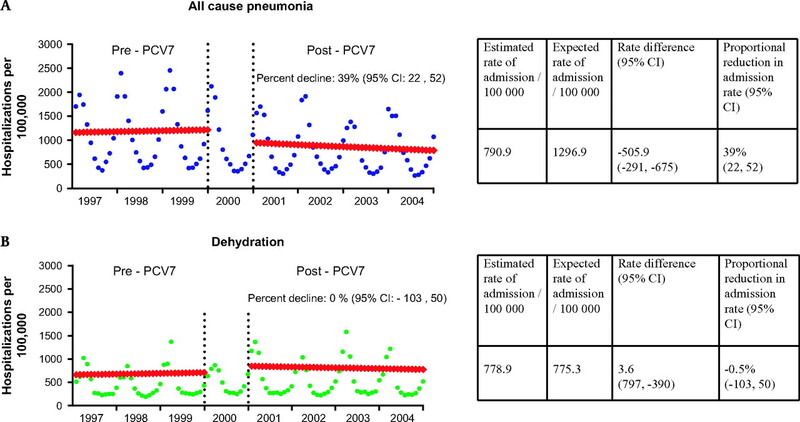 Trends in monthly US admission rates (1997–2004) for (A) all-cause pneumonia and (B) dehydration (control condition) among under 2-year-olds before and after routine immunisation of children with PCV7 (partially reproduced from Grijalva et al36). Non-randomised evaluations are essential to inform public-health decision-making where there are clear barriers to the conduct of RCTs. Over two papers, we have discussed design and analysis choices in order to ensure a ‘fair comparison’ is made. Confounding, however, remains a major concern in these studies, and investigators will face more complex problems even than those we have discussed here such as dealing with covariates that change over time.40 Evaluators and analysts have various options to consider but must make careful, informed choices that fit their context. We hope to have aided these choices. Most importantly, as we and others have stressed, investigators should transparently outline the steps taken in design and analysis so that others can judge the value of the estimates produced. We would like to thank D Elbourne, for her contribution to the development of this paper, and C Grijalva and Elsevier, for sharing the figures reproduced in figure 4. We would also like to thank those who attended a symposium on evaluating public health interventions convened by the London School of Hygiene and Tropical Medicine on 6 November 2006 for contributing insights and thus informing the development of this paper.
. Evaluating the effects of public-health interventions: barriers to randomized trials and alternative options. J Epidemiol Community Health. In press.
. Improving the reporting quality of nonrandomized evaluations of behavioral and public health interventions: the TREND statement. Am J Public Health 2004;94:361–6.
. The Strengthening the Reporting of Observational Studies in Epidemiology (STROBE) statement: guidelines for reporting observational studies. PLoS Med 2007;4:e296.
. Better reporting of randomised controlled trials: the CONSORT statement. BMJ 1996;313:570–1.
. A definition of causal effect for epidemiological research. J Epidemiol Community Health 2004;58:265–71.
. Direct and indirect effects in vaccine efficacy and effectiveness. Am J Epidemiol 1991;133:323–31.
. Modern epidemiology. New York: Lippincott, Williams & Wilkins, 2008.
. Advanced methods for evaluating the impact of family planning communication programs: evidence from Tanzania and Nepal. Stud Fam Plann 2006;3:169–86.
. Causal diagrams for epidemiologic research. Epidemiology 1999;10:37–48.
. Essential medical statistics 2nd edn. Oxford: Blackwell Publishing, 2003.
. The impact of residual and unmeasured confounding in epidemiologic studies: a simulation study. Am J Epidemiol 2007;166:646–55.
. Effects of the use of unreliable surrogate variables on the validity of epidemiologic research studies. Am J Epidemiol 1984;120:643–8.
. Propensity score methods for bias reduction in the comparison of a treatment to a non-randomized control group. Stat Med 1998;1:2265–81.
. A review of the application of propensity score methods yielded increasing use, advantages in specific settings, but not substantially different estimates compared with conventional multivariable methods. J Clin Epidemiol 2006;59:437–47.
. A simulation study of the number of events per variable in logistic regression analysis. J Clin Epidemiol 1996;49:1373–9.
. Constructing a control group using multivariate matched sampling methods that incorporate the propensity score. Am Stat 1985;39:33–8.
. Comparison of logistic regression versus propensity score when the number of events is low and there are multiple confounders. Am J Epidemiol 2003;158:280–7.
. Propensity score methods gave similar results to traditional regression modeling in observational studies: a systematic review. J Clin Epidemiol 2005;58:550–9.
. Analysis of observational studies in the presence of treatment selection bias: effects of invasive cardiac management on AMI survival using propensity score and instrumental variable methods. JAMA 2007;29:278–85.
. Causal knowledge as a prerequisite for confounding evaluation: an application to birth defects epidemiology. Am J Epidemiol 2002;155:176–84.
. Propensity scores: help or hype? Nephrol Dial Transplant 2004;19:1671–3.
. Instruments for causal inference: an epidemiologist's dream? Epidemiology 2006;1:360–72.
. Identification of causal effects using instrumental variables. J Am Stat Assoc 1996;91:444–55.
. Instrumental variables: application and limitations. Epidemiology 2006;1:260–7.
. Econometrics in outcomes research: the use of instrumental variables. Annu Rev Public Health 1998;19:17–34.
. Change from baseline and analysis of covariance revisited. Stat Med 2006;25:4334–344.
. A paradox in the interpretation of group comparisons. Psychol Bull 1967;68:304–5.
. Two statistical paradoxes in the interpretation of group differences: illustrated with medical school admission and licensing data. Am Stat 2004;58:117–23.
. Correcting for regression dilution bias: comparison of methods for a single predictor variable. J R Stat Soc Ser A 2000;163:173–89.
. A community-based study to examine the effect of a youth HIV prevention intervention on young people aged 15-24 in South Africa: results of the baseline survey. Trop Med Int Health 2005;10:971–80.
. Randomization by group: a formal analysis. Am J Epidemiol 1978;108:100–2.
. Quasi-experiments: interrupted time-series designs. Experimental and quasi-experimental designs for generalized causal inference Boston: Houghton Mifflin, 2001.
. The value of interrupted time-series experiments for community intervention research. Prev Sci 2000;1:31–49.
. Decline in pneumonia admissions after routine childhood immunisation with pneumococcal conjugate vaccine in the USA: a time-series analysis. Lancet 2007;369:1179–86.
. Effect of air-pollution control on death rates in Dublin, Ireland: an intervention study. Lancet 2002;360:1210–14.
. An interrupted time series analysis of parenteral antibiotic use in Colombia. J Clin Epidemiol 2003;56:1013–20.
. Transitional regression models, with application to environmental time series. J Am Stat Assoc 2000;95:16–27.
. Effect of highly active antiretroviral therapy on time to acquired immunodeficiency syndrome or death using marginal structural models. Am J Epidemiol 2003;158:687–94. Funding JH was supported by an MRC/ESRC interdisciplinary postdoctoral fellowship. Public health evaluation: which designs work, for whom and under what circumstances?